At one time or another most of us have played golf in a business situation often with customers or potential customers and sometimes it hasn’t gone too well. Whether it’s having novice golfers on the back tees or being stuck with the guy who never turns off his smartphone, there are literally dozens of do’s and don’ts that can make the mixture of business and golf a bust or success. Lots has been written about the synergy of golf and business but I know of no one until now to have enumerated what should be done to ensure a successful linking. Author John Glozek fortunately not only understands all of this but has written a book entitled Business Golf – The Best Business Meeting You’ll Ever Have. 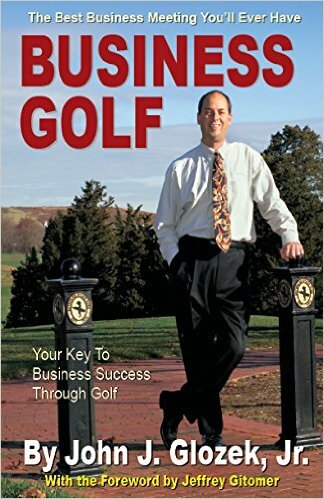 It is a must read if you use or want to use golf as a positive tool for your business relationships. And Glozek has the credentials to know, since in addition to being a golf fanatic he is publisher of an award winning publication named Golfing Magazine based in Long Island, N.Y. Plus if that weren’t enough to prove his bona fides, he is President of one of the leading golf industry organizations, the International Network of Golf. It includes probably the best one liner in the book. Glozek also tapped the knowledge and experience of a number of business people for their views about the golf and business combination including Donald Trump and there’s even a short contribution by yours truly. Even if you’re an old hand of using golf to further your business interests I guarantee you will find a wealth of information in Business Golf to make your next foursome or corporate event a smashing success.